english name "Javan Slender Caesar"
The following is based on Corner & Bas (1962) and Boedijn (1951). The cap of A. javanica is 60 - 85 mm wide, orange yellow to ochre-yellow, sometimes with a reddish brown tinge, antique brown to maize yellow to raw sienna between orange and xanthene orange to yellow ochre in the center, gradually changing towards the margin to light cadmium to between apricot yellow and empire yellow to light orange yellow or deep chrome, strongly convex at first, later plano-convex, umbonate, with a sulcate-striate margin (about 50% of the radius). The flesh is off-white, 4 - 6 mm thick above the stem, and rapidly thinning to a membrane. The gills are free, yellow in side view, orange yellow in mass, and 8 - 12 mm broad. 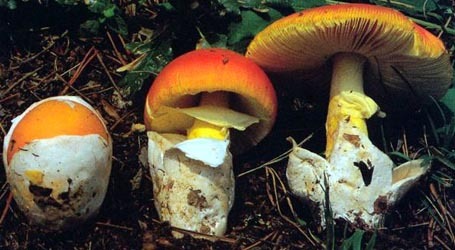 The stem is 90 - 130 × 10 - 14 mm, narrowing upward, yellow (for example, near apricot yellow), decorated with orange buff scales. The ring is 20 - 30 mm from the top of the stem, skirt-like, hanging loosely, orange buff, and finely striate on the upper surface. The saccate volva is off-white, 20 - 50 × 30 - 35 mm and up to 3 mm thick. Spores measured by Boedijn 8 - 12 × 6 - 8 µm and are ellipsoid and inamyloid. Clamps are present at bases of basidia. Spores measured by RET from Japanese material are as follows: (9.2-) 10 - 13 (-16) × (6.5-) 7.2 - 8.2 (-10) µm. This species was originally described from Java. The species currently widely reported from southeast Asia (Japan, China, Nepal, and northern India); however, RET and ZLY have reservations concerning whether the mainland material is indeed the same species as A. javanica (see below). In Japan, the species reported as A. javanica occurs in pine-oak forests (Pinus densiflora and Quercus serrata). No associated plants were mentioned by Boedijn. The present species is placed in Amanita stirps Hemibapha. author (Corner & Bas) T. Oda, C. Tanaka & Tsuda. 1999. Mycoscience 40: 64. ≡Amanita hemibapha subsp. javanica Corner & Bas. 1962. Persoonia 2: 297. =Amanita hemibapha sensu Boedijn. 1951. Sydowia 5: 320. The following material is derived entirely from the protolog of the present taxon, which must be taken to include the description of Boedijn (1951) under the misapplied name "Amanita hemibapha". pileus 60 - 85 mm wide, with color varying extensively, darkest over disc (about Antique Brown or Maize Yellow or Raw Sienna or between Orange and Xanthine Orange or Yellow Ocher), toward the margin gradually changing to Light Cadmium Yellow or between Apricot Yellow and Empire Yellow or Light Orange Yellow or Deep Chrome Yellow smooth; context dirty white, 4-6 mm thick near stipe, about 3 mm at mid-radius, "gradually thinning out near the margin" [inconsistent with long marginal striations—ed. ]; margin sulcate-striate (0.5R); universal veil [apparently absent—ed.]. lamellae free, yellow, about Empire Yellow or between Baryta Yellow and Pinard Yellow, 8 - 12 mm broad at mid-length, with edges orange-yellow. stipe 90 - 130 × 10 - 14 mm, about Apricot Yellow above partial veil, below yellow (between Apricot Yellow and Empire Yellow or between Empire Yellow and Pinard Yellow), at first covered with orange buff appressed scales, becoming glabrous, narrowing upward; context hollow: partial veil orange-buff, dependent, lax, finely striate, about 20 - 30 mm below apex; universal veil as saccate volva, free, sheathing, 20 - 50 × 30 - 35 mm, with limb up to 3 mm thick. basidia 27 - 36 × 8.0 - 10.0 μm, 4-sterigmate. basidiospores [-/-/-] 8.0 - 12.0 × 6.0 - 8.0 μm, ([est.] Q = 1.30 - 1.50). material examined INDONESIA: JAVA—Poentjak Pass, 18.x.1941 F. B. Boedijn s.n. (holotype, BO); Tijbodas, xi.1923 Van Overeem s.n. (paratype, ? ?BO), ix.1931 F. B. Boedijn s.n. (paratype, ? ?BO).